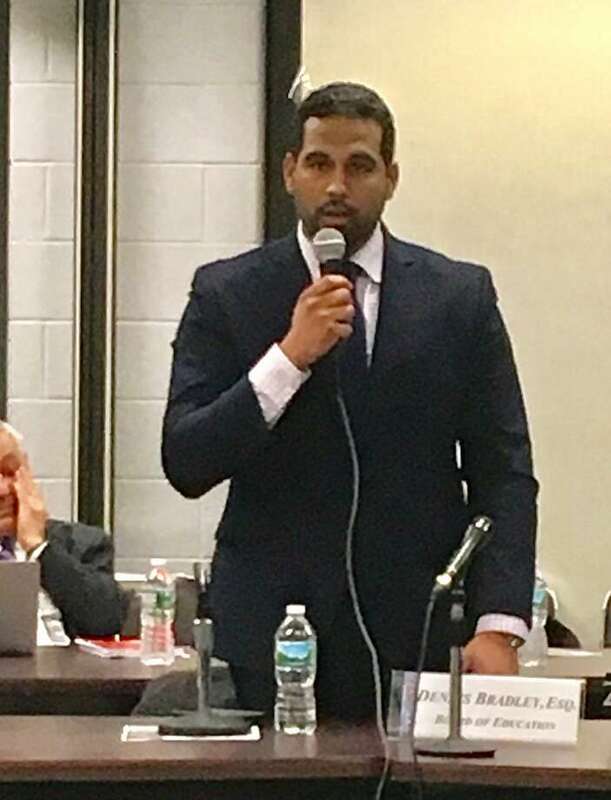 BRIDGEPORT — State Sen. Dennis Bradley announced on Monday he is resigning from the city school board, most likely by Wednesday. That will start a 30-day clock during which the school board can select a replacement. If it cannot, Mayor Joseph Ganim gets to pick the new board member. “My heart was to stay on but I thought this was best,” said Bradley, who spent his last board meeting handing out framed certificates — signed by House Speaker Martin Looney and Secretary of State Denise Merrill — to his fellow board members and Schools Superintendent Aresta Johnson. He saved the last presentation for board member Maria Pereira. Pereira declined to take the plaque, calling Bradley one of the most insincere individuals she knows. She also came to the meeting with a spread sheet that outlined Bradley’s sparse attendance record at board meetings. The two ran together along with Ben Walker in 2015 as petition Democrats but quickly had a falling out. A week after all three were elected, Bradley became school board chair. Bradley and Pereira often clashed. By the fall of 2016, Bradley, with other board members, staged a boycott of regular meetings in an attempt to get Pereira to resign. It didn’t work. By the time another board chair election came up in December 2016, Bradley was out as chair. Twice during his tenure, Bradley ran for state senate, losing a primary bid in 2016 and winning this past November to represent the state’s 23rd district, which includes part of Bridgeport and part of Stratford. Bradley called serving on the school board a tremendous experience and said he believed the best way to tackle the district’s chronic underfunding problem is at the state level. He said he believed much of the animosity, uncivil discourse and rancor on the board stems from that underfunding. “It’s a hard process,” Bradley conceded. Bradley said he expects to submit his resignation to the City Clerk’s office on Wednesday. Board member Joseph Sokolovic urged the board to call a special meeting as soon as possible after the resignation becomes official. “We want to control our own destiny,” Sokolovic said.